Driving down the street in the small upstate NY town of Millbrook I saw the sign above. Because I was watching out for pedestrians and hoping the traffic light wouldn’t change, my eye only caught the words FREE PIZZA, which was what the restaurant wanted me to see. 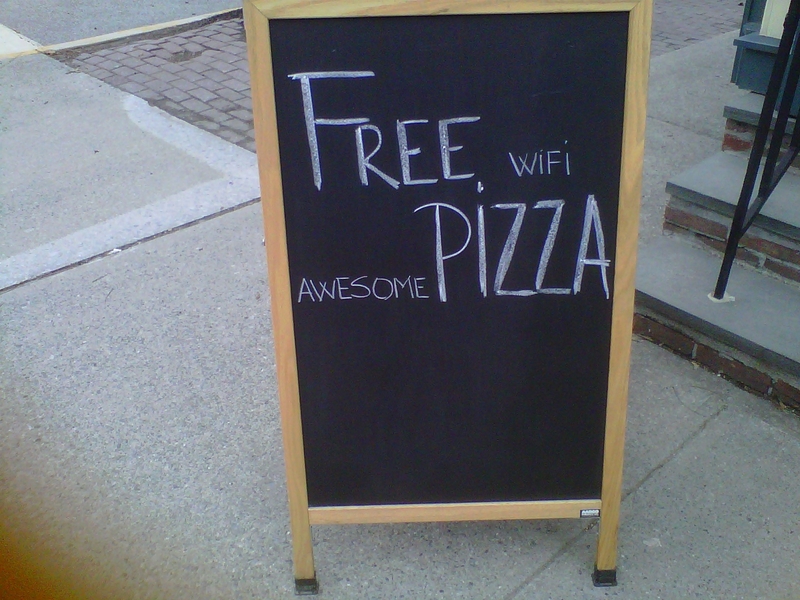 I had to stop because the light was now red and I then saw what else was written on the chalkboard: That what is “free” is Wifi and that their pizza is “awesome.” The sign may have been an attempt at humor but it annoyed me enough for me to change my luncheon plans that day. I recently fell for a promotion. The monthly charge is $40+ more than I thought it would be once the rental of this or that piece of essential equipment and the taxes and other fees are added in. We have a two year contract and I fully expect the price to reach the stratosphere as soon as the contract is up. I’ve written before about my grandfather who was the first to draw such chicanery to my attention when I was about eight. I saw banners touting unbelievably cheap car prices and Grandpa mumbled that those were for cars without steering wheels and brakes and that the charge would be far higher if you wanted those essentials in your car. Laws and regulations aside, this technique is ancient, tiring and off-putting. It focuses on tricking people into immediate sales with no view to the long term. What’s nutty is that the restaurant makes good pizza and DirecTV [which we have upstate] and the company that provides a phone/TV/Internet package we now have provide quality products as well. Why do they need to stoop to such measures? Have you felt fleeced by or noticed similar shady sales practices that irritate you? Have you changed your mind about buying a product or service as a result? This entry was posted on Thursday, April 9th, 2015 at 9:34 am	and is filed under Advertising, Fine Print, Lies, Marketing, Restaurant, Small Print	. You can follow any responses to this entry through the RSS 2.0 feed. You can leave a response, or trackback from your own site. I do not remember a world in which somebody was not trying to cheat somebody else, but I do remember when “Ma Bell” (AT&T) was everybody’s grandmother, always reliable, both for service and as an investment. Now, it has fallen so low that it is being replaced by Apple in the Dow! I try to do my best to ignore advertising and trust no one’s ads, but even I am susceptible to the slick “come-on,” and boy, have I lived to regret it. The best policy is deal with suppliers, the smaller the better, that you personally know and trust and don’t read or listen to anybody’s ads. Funny about AT&T. My mobile phone–I use Verizon–doesn’t work at our upstate house which is in the middle of nowhere but people who use AT&T get a signal and can be reached and call out. I am tempted to change but hear that AT&T isn’t that great in NYC. I, too have fallen for all sorts of stuff. Who hasn’t? Whether or not I’m entrapped, I don’t think well of the company that pulls such stunts. As one of innumerable consumers who has been tricked or fleeced at one time or another I still wonder why it is necessary for any individual or corporation that is interested in a customer base or a following to use this kind of duplicity. Even if the deception lures you in the consequences can range from inconvenient, troubling or distuprive and even to criminal. Grandeur or scale it would seem permits many businesses to be equally extravagant in their misbehavior. Aren’t all the Wall St. banking and mortgage scandals simply large scale examples of this conduct at a higher powers? Isn’t that what people like my Senator from Massachusetts, Elizabeth Warren is protesting? Certain consequences of this type of behavior make for an increasingly cynical public, and a much more hostile environment. Don’t we all pay in the end? I come out with a matching conclusion, though all these sleazoids are counting on the sucker that’s born every day. For years I wondered why I get repetitive requests for money from the same charitable institutions, even if I’ve just sent a check. Cynical though this reason may sound it makes sense. A relative said that her accountant was the first person with proof of her husband’s Alzheimer’s disease. He’d sent hefty checks to the same charities time after time–each time he’d get a request. Talk about taking candy from a baby. Hearing this made me cringe and I am again wincing as I write about it. Bait and switch is against the law, and has been for years. Ralph Nader is to thank for that. Trouble is few take the time to complain, so scammers continue to fleece the flock. Thieves thrive on human laziness, ignorance and greed. They will continue to prosper, because the general public can’t or won’t exercise common sense. Scammers should not be confused with legitimate businesses who every so often offer deals one can’t refuse. Vigilance is key. As to the free pizza, one need only demand what’s on the placard, making the establishment realize you know the law…..and the pizza will be yours. Just don’t plan to visit again any time soon! Thanks to Bait and Switch laws/Nader, DirecTV is being taken to task. As sharp a consumer as I try to be, tucking away in my memory bank the schemes and tricks I’ve fallen for or heard about, I’ve found that people who are superb con types will always have one over me. Doesn’t mean I don’t stay vigilant, but gosh. As I note on my post, when a company provides a good service–or a good pizza–why bother with sleazy tactics? 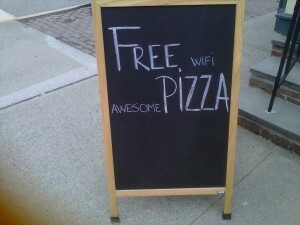 As for demanding a free pizza, I am currently turned off on the place so wouldn’t digest it well at any price.